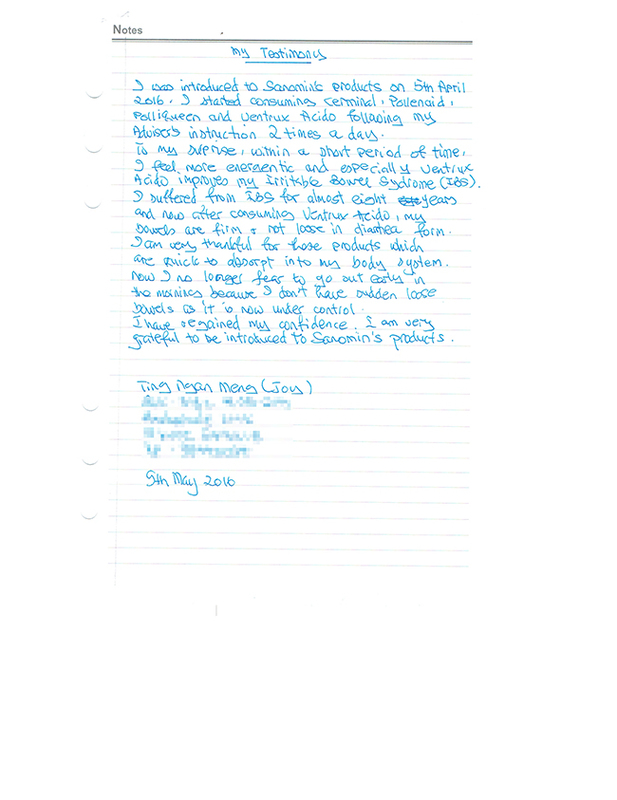 I would like to give my personal testimony of taking the health supplements. I have been diligently consuming the health supplements for the past 10 over years. The reason why I persisted till today despite the costs is because of the health and wellness benefits the products bring to me. I am less vulnerable to the common sickness such as fever, flu, cough or sore throat, unlike those days before I know this product through my best friend and Ms Yee Siew Guat from Sanomin and continued to reap the benefits throughout my pregnancy. My son’s health has not been givine me much problem since young. So all the savings in medical costs outweighs the investment I put in for Sanomin products. As for maintaining youth, though it cannot slow down the biological clock, the products have nevertheless retarded the ageing symptoms on my face and make me look younger than my real age. Of course that also includes my disciplined regime in diet and exercise. 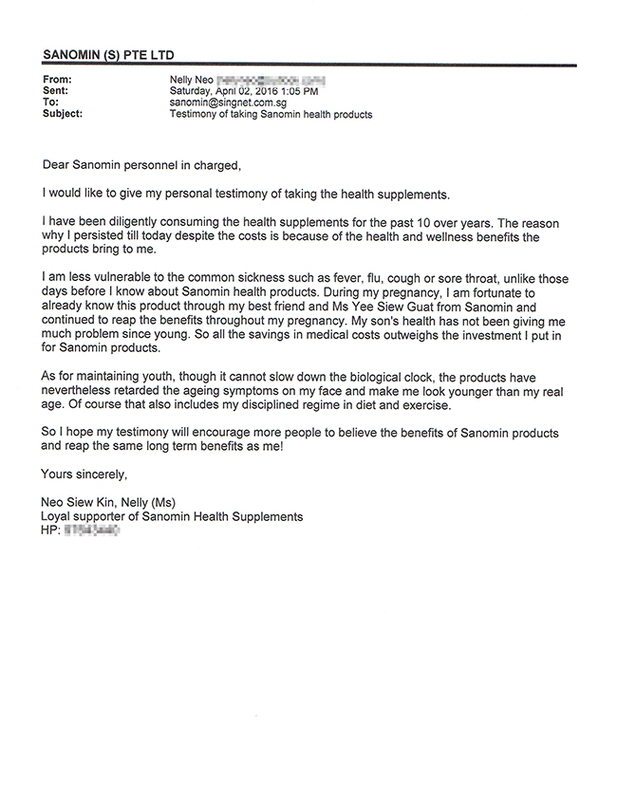 So I hope my testimony will encourage more people to believe the benefits of Sanomin products and reap the same long term benefits as me! 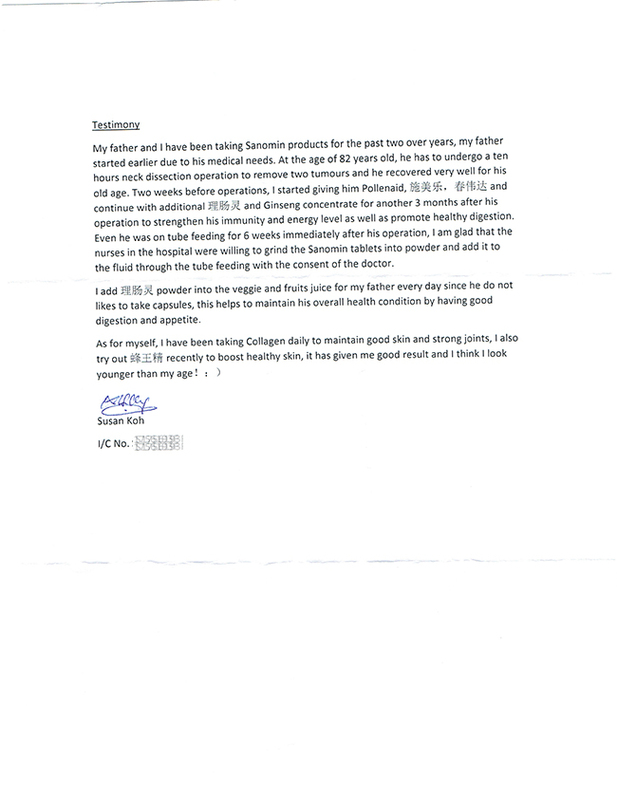 My father and I have been taking Sanomin products for the past two over years, my father started earlier due to his medical needs. At the age of 82 years old, he has to undergo a ten hours neck dissection operation to remove two tumours and he recovered very well for his old age. Two weeks before operations, I started giving him Pollenaid, Cerminal, Pollital and continue with additional Ventrux Acido and Ginseng PE Concentrate for another 3 months, after his operation to strengthen his immunity and energy level as well as promote healthy digestion. Even he was on tube feeding for 6 weeks immediately after his operation, I am glad that the nurses in the hospital were willing to grind the Sanomin tablets into powder and add it to the fluid through the tube feeding with the consent of the doctor. I add Ventrux Acido powder into the veggie and fruits juice for my father every day since he do not like to take capsules, this helps to maintain his overall condition by having good digestion and appetite. I was introduced to Sanomin’s products on 5th April 2016, I started consuming Cerminal, PollenAid, PolliQueen and Ventrux Acido following my adviser’s instruction 2 times a day. To my surprise, within a short period of time, I feel more energetic and especially Ventrux Acido improves my Irritable Bowel Syndrome (IBS). I suffered from IBS for almost eight years and now after consuming Ventrux Acido, my bowels are firm and not loose in diarrhea form. I am very thankful for these products which are quick to absorb into my body system. Now, I longer fear to go out early in the morning because I don’t have sudden loose bowels as it is now under control. I have regained my confidence. I am very greateful to be introduced to Sanomin’s products. In October 2015, my husband felt very weak. He looked very pale, nausea with no appetite, unable to eat cooked rice so I had to cook porridge for him. He also lost a lot of weight and his walking was very unsteady. I brought him to a nearby Polyclinic. 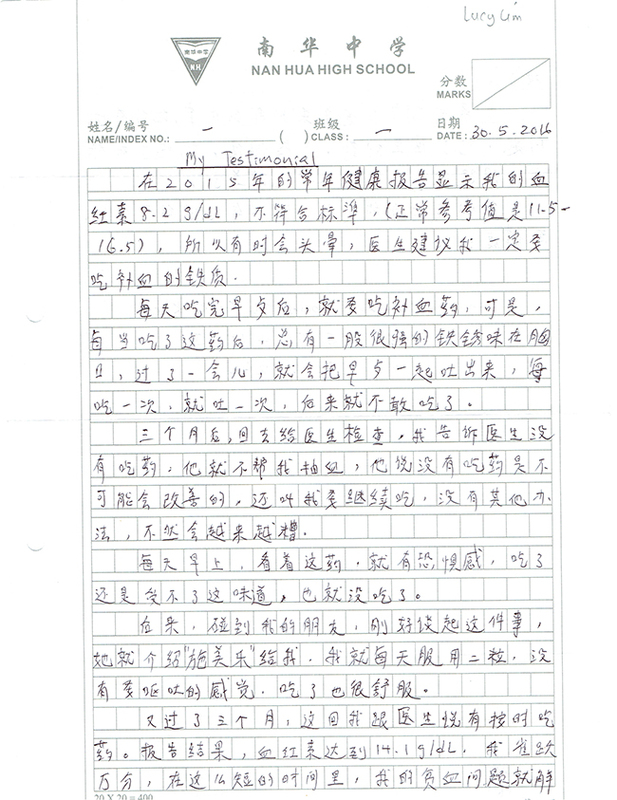 From the doctor’s investigation, he had lost 9kg and his Haemoglobin reading was only 7.6. A normal reading should be 14. He often complained of chest pain and irregular opening of bowel. 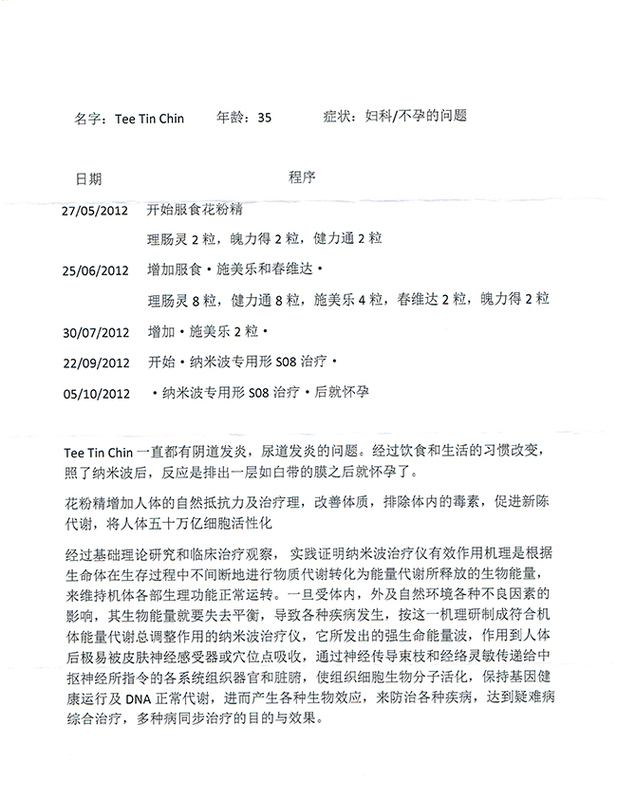 The doctor referred him to SGH’s A&E for blood transfusion. In A&E, he was given 1 pint of blood and to see the specialist in 3 months’ time. I asked Siew Guat for advice and was told to start him on Cerminal, Pollitromb, PollenAid, Ventrux Acido and Pollitabs Sport, 4 times daily. After 1 month, his condition improved. His chest pain slowly becoming lesser and lesser. His appetite improved and he can eat cooked rice. After 3 months, his weight gained by 4kg, haemoglobin goes up to 9.6. Now he is much stronger and in better health. 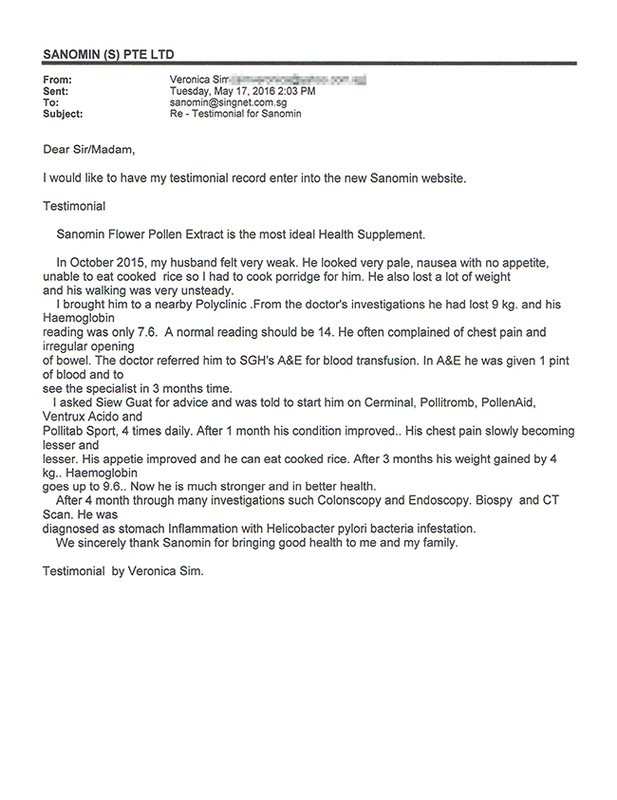 After 4 months through many investigations such Colonscopy and Endoscopy, Biospy and CT Scan, he was diagnosed as stomach inflammation with Helicobacter pylori bacteria infestation. 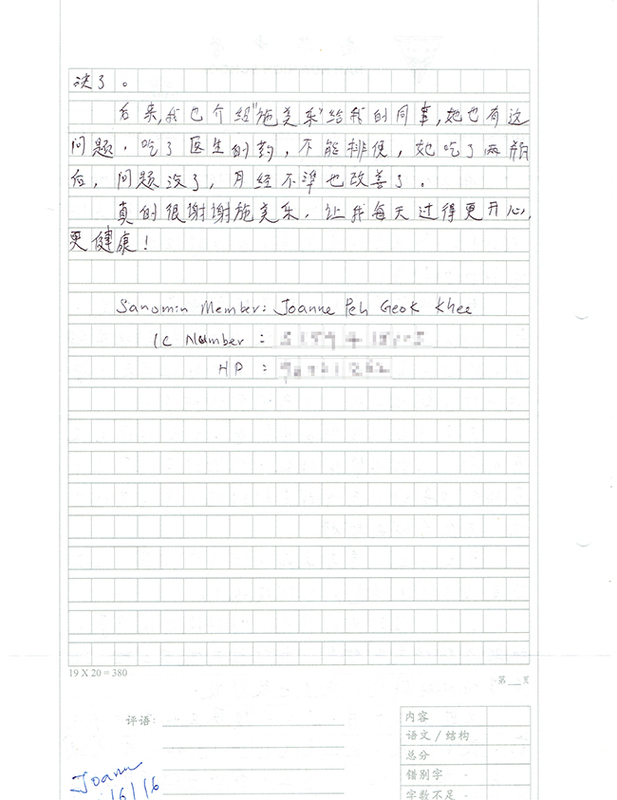 We sincerely thank Sanomin for bringing good health to me and my family.